Description: Wrap front dress has soft pleats, side tie, and sleeve variations. Dress B has collar. If you've been reading my site for a while, then you would know that I LOVE wrap dresses! I had been reluctant to buy this pattern for the longest. I just didn't see the point because it was so similar to the Kwik Sew patterns that I had done last year. But, I had seen great reviews on it and thought, "What the heck?" So I decided to give this one a shot... what could it hurt? Let me tell you what I liked about this pattern: I like the 3/4 length sleeves. This is the perfect wrap dress for early Fall and Spring. However, I love the full length sleeves of the Kwik Sew pattern. This dress was a little shorter than I would normally choose, but since I knew that I would be wearing it this Fall, I kept it at this length and added tights. I will probably make this again, maybe the short sleeve version for summer. 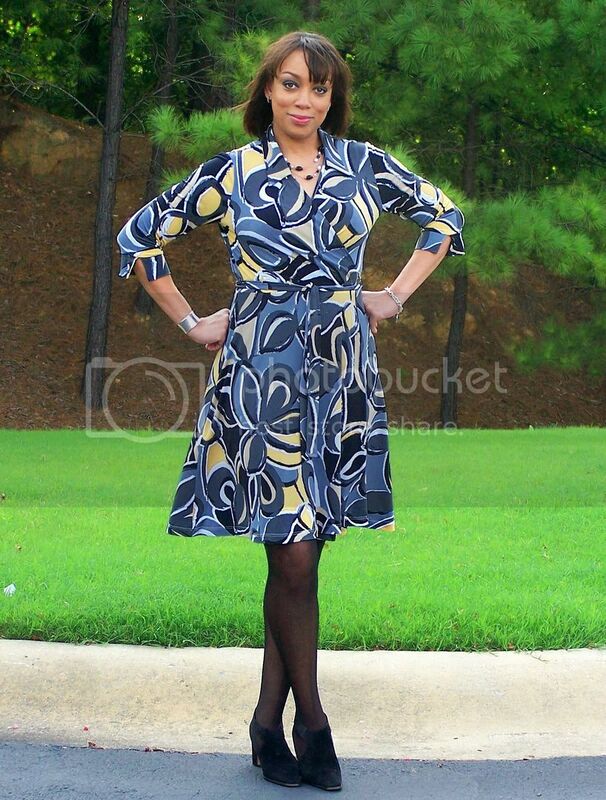 But if I had to choose, I would definitely pick Kwik Sew 3489 for my TNT wrap dress.